German Chamomile, (Matricaria recutita), is an annual herb. It looks similar to a daisy, with small white petals circled around a yellow center. It grows close to the ground in the wild or as borders in herb gardens. It blooms early to mid summer months. The word chamomile means "earth apple on the ground". This natural herb has a strong, sweet, apple, scent. Chamomile comes in different forms: dried flowers, tea, capsules and essential oil. It's often blended with other herbs to increase its effectiveness. Chamomile is a powerful antioxidant! It's anti-viral, anti-fungal, anti-microbial, anti-spasmodic and anti-inflammatory. 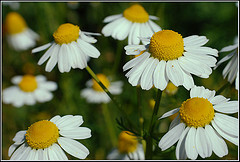 German chamomile is most commonly used, medicinally. It's generally safe to use. However, there are CAUTIONS to heed! Chamomile can interact with other herbs, supplements or medicines. Seek advice from your health care provider, if needed. CAUTION! Essential oils contain bioactive ingredients. They're potent chemicals and should be used with care! Never use large amounts of ANY essential oils externally or internally. Never use them straight. They must always be diluted in carrier oil, soap, lotion or other buffering agent. Never use without knowing what their bioactive compounds are known to do. German Chamomile, (Matricaria recutita), and Roman Chamomile, (Chamaemelum nobile), come from different species of plants. Roman Chamomile is a perennial herb, unlike the annual German herb. Both herbs look similar and are used interchangeably. Chamomile tea is an antioxidant drink with golden color and delicious, fruity, flavor. 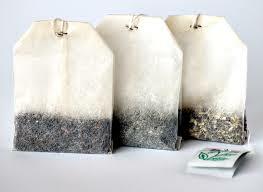 Drink, healthful, chamomile tea or use the tea bags to reduce under eye puffiness and dark circles. The health benefits of tea are numerous for the body, skin and hair! RELIEVE: anxiety, stress, tension, chest colds, sore throats, gingivitis, insomnia, headaches, migraines, motion sickness, muscle spasms, stomach aches, stomach ulcers, diarrhea, gas indigestion, irritable bowl syndrome, chicken pox and colic. RELIEVE: dry itchy skin, (eczema, diaper rash) and minor skin irritations, (scrapes, bee stings, hives). This homemade skin care recipe is good for all skin types. Store in a cool, dry, place up to 2 months. DIRECTIONS: Boil 1/4 cup tap water for 3 minutes. Let cool. Pour cooled water in a 4 oz. storage container or spray bottle. Add 1 tbsp. witch hazel, 1/2 tsp. vegetable glycerin, 5 drops clary sage essential oil, 5 drops grapefruit essential oil and 5 drops german chamomile essential oil to cooled water. Shake mixture well to blend. Place small amount of mixture on cottonball. Gently dab cottonball on clean face. Avoid eyes, ears, nose, mouth or any other sensitive areas. Afterwards, apply your favorite moisturizer. Add German chamomile brewed tea, (cooled), dried grounded tea leaves or German chamomile powder to homemade soap recipes. The powder can turn soap a brownish color. Dry tea leaves add a speckled look to homemade soap. 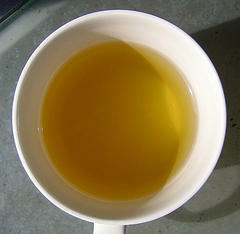 USING CHAMOMILE TEA: Brewed chamomile tea can be used up to 100% of your liquid. In the soap recipe above, 19 oz. of brewed chamomile tea would fully replace the 19 oz. of goat milk. USING CHAMOMILE POWDER: Use only up to 1 tsp. per 2 pounds of oil. For the soap recipe above, 1 and 1/2 tsp. of powder would be plenty. USING CHAMOMILE TEA LEAVES: Use only up to 1 tsp. per 2 pounds of oil. For the soap recipe above, 1 tea bag of leaves would be plenty. Cut open one german chamomile tea bag and add it to your soap mixture.